In 1951, Howard Meyer designed this International Modern style home for Mr. and Mrs. Ben Lipshy. It was beautifully restored by Carolyn and James Clark in 1981. Art and architectural historian Rick Brettell calls this "the finest International Modernist house in Texas." A few years earlier Howard Meyer designed the Morris Zale residence at 4400 Rheims Place. This home with its pronounced horizontal bands of irregular stone and wide flat eaves protruding from the gently sloped roof, is truer to the Prairie style homes of Frank Lloyd Wright than is the Frank Lloyd Wright designed home in Dallas. Tragically, this home on a double lot was torn down for a 2003 speculative Mediterranean mansion. 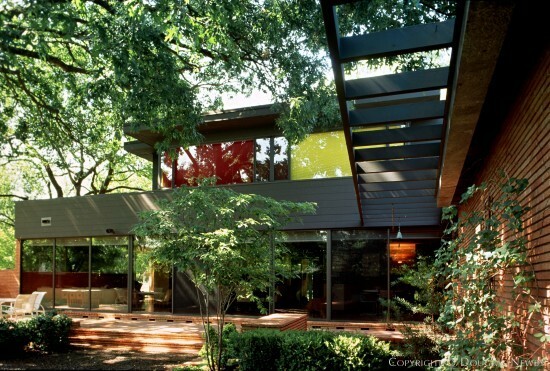 This house, more than any other, exemplified the strong architectural connection between Chicago and Dallas and the forward thinking modernism of Dallas in the mid-century. Fortunately, despite this loss, Dallas still has the home at 5381 Nakoma. In 1982, the Clarks retained the then 84-year old Howard Meyer, who was assisted by Arch Swank, to restore and adapt 5381 Nakoma for their home. A thin refined brick with a deep, coarse line, a flat roof and a composition of glazed openings creates a much more modern home. The continuous horizontal pattern of the brick walls continues inside creating the perimeter for the cantilevered open staircase that becomes the sculptural centerpiece of the home. Soft surfaces of redwood, Mexican brick and cork floors play off the graceful but stern shape and materials of the staircase and windows. Its importance is further enhanced by its prominent location in Greenway Parks, overlooking one of the community owned greenbelts and public parkways. "Pastoral Greenbelts link the neighborhood and the neighbors."